Today is the Feast of St. Scholastica; around the world, people read the story of Benedict and Scholastica’s last meeting – and the superiority of her love over his obedience. Rather than the well-known Subiaco fresco showing the meal, I chose the fresco of her burial procession, found a bit further into the church at Sacro Speco. I had the opportunity to talk with some students about Benedict and Scholastica today – sisters often give 5-10 minute presentations in a variety of classes. Relating St. Benedict‘s life made me realize how much the vow of stability contrasted with his own life. It was Scholastica who probably experienced the life of stability, living at home until founding a community of women near her brother’s monastery. There is a spirituality of stability: choosing to live with and through difficult situations rather than depart and try again somewhere else. Women’s traditional roles limited her travel and business in the world; monastic stability required her to find satisfaction through her life of prayer. To modern eyes, this might seem quite constrained – yet she seems to have flourished. 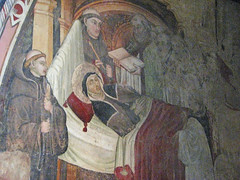 This image details the detour of the monks carrying her to burial – the went past St. Benedict’s own monastery, so that her brother could make his final farewell. Even this last bit of vagabond travel was due to her signature trait – the love that bound her close to her brother. interesting. the hungry man appreciates the value of bread better.